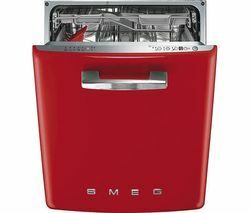 Smeg make the most stylish dishwashers available. Smeg dishwashers are beautifully crafted and will make cleaning up after meal times quicker and a lot easier, so you’ll have more time to spend doing the things you want to do. When you’ve cooked a big meal for a dinner party, the last thing you want to do is get stuck in the kitchen doing the washing up. If you have a Smeg dishwasher, you can simply load it up, and it’ll take care of your dirty plates and pans, leaving you free to relax with your guests. Smeg dishwashers are available in a number of different finishes including classic white, cream, silver, black and professional stainless steel. Each Smeg dishwasher uses the latest technology to ensure even hard to clean items come out sparkling and smudge free. They also have great energy ratings, so they use less water to clean your dishes and are better for the environment as a result. 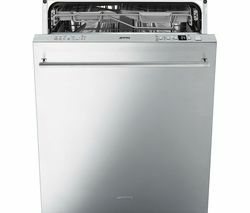 If you want a dishwasher you can rely on, take a look at our range of Hotpoint dishwashers. And if you’re looking for a stylish dishwasher that will look great in your kitchen, then take a look at our selection of Neff dishwashers. Whether you want to spend less time cleaning up after meals, or you want an appliance that will complement your kitchen, a Smeg dishwasher is ideal.